Complimentary Bread - Served warm, the foccacia was crusty with a soft and airy center. We had seconds. 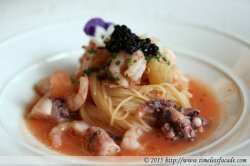 Seasonal Seafood Salad With Cold Angel's Hair, Smoked Caviar & Chilled Spicy Tomato Soup - A mildly spicy, tart and chilled broth coupled with fresh seafood (shrimp, octopus, fish etc) and a little less than al dente angel hair pasta. Topped with a small spoonful of rather inferior caviar (can't complain for the price though!). Still a pretty decent eat though and I particularly liked how the coldness of the pasta and soup gave it a mildly refreshing spin from the norm. 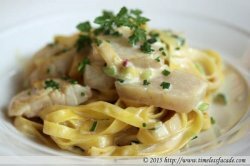 Fettuccine With Hokkaido Scallop, Truffled Cream Sauce & Chives - The fettuccine was al dente whilst the truffle cream sauce gave it a nice creamy taste that didn't threaten to overwhelm the senses. The scallop slices, though relatively generous, were a little bland and on the soft side, which highlighted the lack of contrast in both texture and taste of this dish. Still a decent eat nonetheless. Valrhona Chocolate & Extra Virgin Olive Oil Mousse With Crispy Caramelized Hazelnut & Macadamia Nuts Sauce - I quite enjoyed this sweet ending to our meal. Smooth valrhona chocolate mousse sitting atop a thin slice of limp sponge and topped with a crisp caramelised hazelnut crumble that threatened to stick to my teeth at every possible instance. Couldn't quite make out the olive oil though.